Auckland House in Wiltshire is the latest in a series of projects architect and urban design specialist Broadway Malyan has designed for RWE Npower Renewables, one of the UK’s leading renewable energy developers and operators. The brief demanded a state-of-the-art workplace with the flexibility to support a growing international business. There had to be a clear link between the design and the company’s corporate brand values, namely proving safe, clean, renewable energy. ‘The design is predominantly open-plan with a variety of alternative workspaces for team and individual activities. 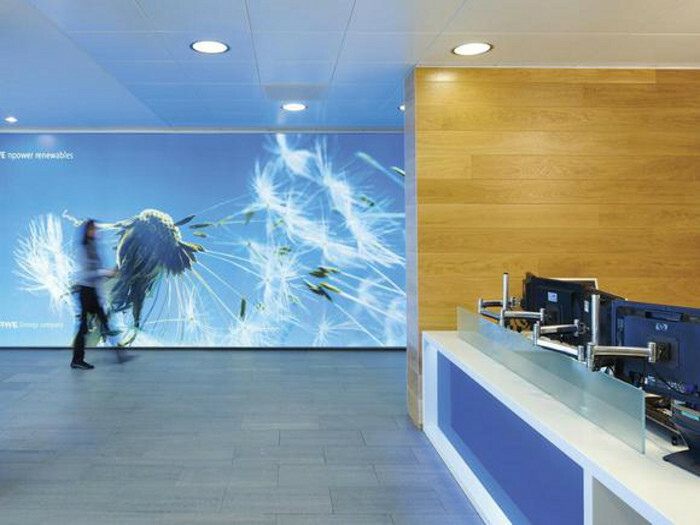 Team working and communication between expert disciplines is a key part of the business, so the workplace had to be designed to suit,’ says Szpakowski. Broadway Malyan brought in workplace consultancy AMA Alexi Marmot Associates, which interviewed key staff members to find out what they needed from an office; a project control board met weekly to make key decisions on the design, and staff focus groups tested the design at various stages of the project. The reception is located clearly at a prominent corner of the building. It has a bespoke reception desk designed by Broadway Malyan and made by Apollo Design and Build. The designers worked hard to create a natural look in the building, choosing a slate-effect tile from Domus for the floor in reception and natural oak floors from Junkers elsewhere. 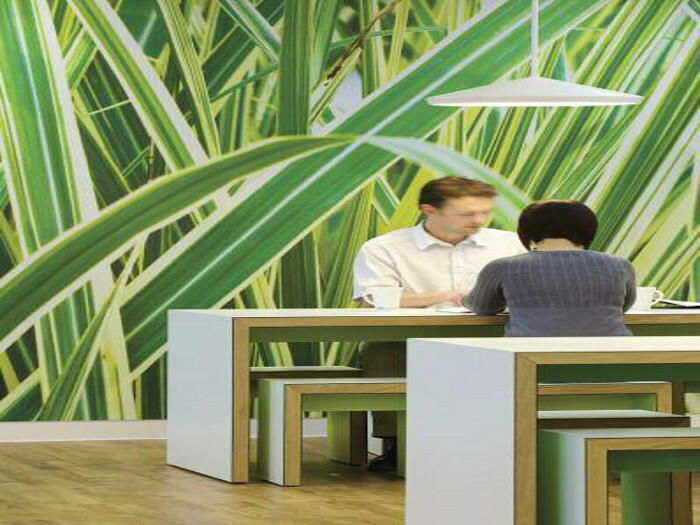 Broadway Malyan worked with RWE Npower Renewables’ branding consultant to come up with a set of images that represent the company, which have been used as wall graphics. Beyond the reception, one of these images, a dandelion clock against a blue sky, has been applied to a material called flexface, (commonly used for outdoor advertisements and signs), and backlit with LEDs. The reception gives on to a lounge, which is used as a visitors’ waiting area and for informal meetings. It is furnished with sofas and armchairs from Hitch Mylius. A graphic of a tree with its leaves blowing across an autumnal sky dominates one wall. The restaurant is a focal point for gatherings, social events, and informal meetings. Simple and stylish, it has a natural oak floor, benches and tables by James Burleigh and Ginko pendant lights by Örsjö. 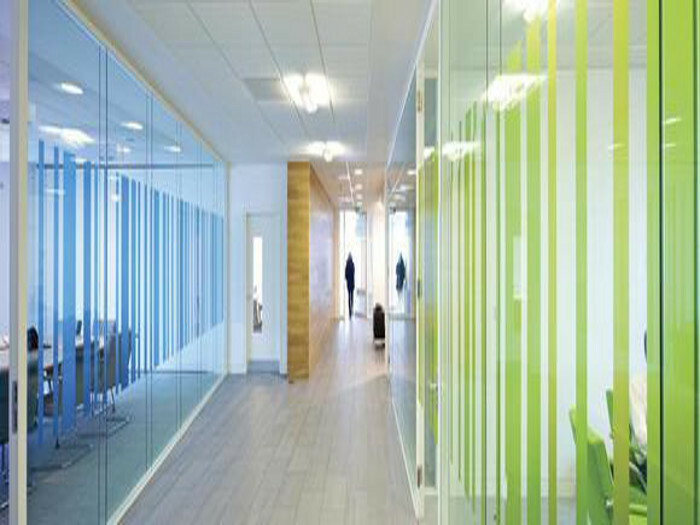 To balance the minimalism of much of the scheme, Broadway Malyan decided to inject a bit of colour into the meeting area. 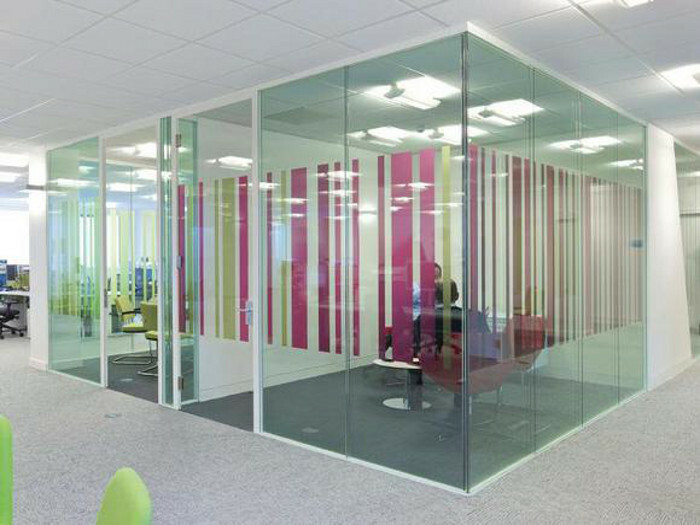 Glass-fronted meeting rooms have been decorated with a pattern of vertical stripes, which correspond to the colours of the furniture inside. ‘It was just about trying to get a balance between privacy and transparency. So we did these different densities of line and the client ended up choosing about 40 per cent privacy,’ says Szpakowski. A small library area has been set aside for research and quiet work, and several of the meeting rooms are furnished with sofas and comfortable chairs to provide a more relaxed environment. ‘These have proved to be very popular with the staff,’ says Szpakowski. The open-plan layout of the main office areas has been designed so that desks, storage facilities and breakout furniture can be easily rearranged. Furniture dealer Salt and Pegram sourced most of the office furniture from Orangebox, except desks and storage units, which came from Steelcase. The designers at Broadway Malyan are well practised at designing this kind of user-oriented office space, but the project had to be implemented quickly and on a tight budget. ‘Decision-making had to be fast,’ says Szpakowski, ‘and a strong project manager was essential to keep all of the consultants on track.